I’m so excited to team up once again with Kirkland’s for their Resolve to Organize campaign this week! 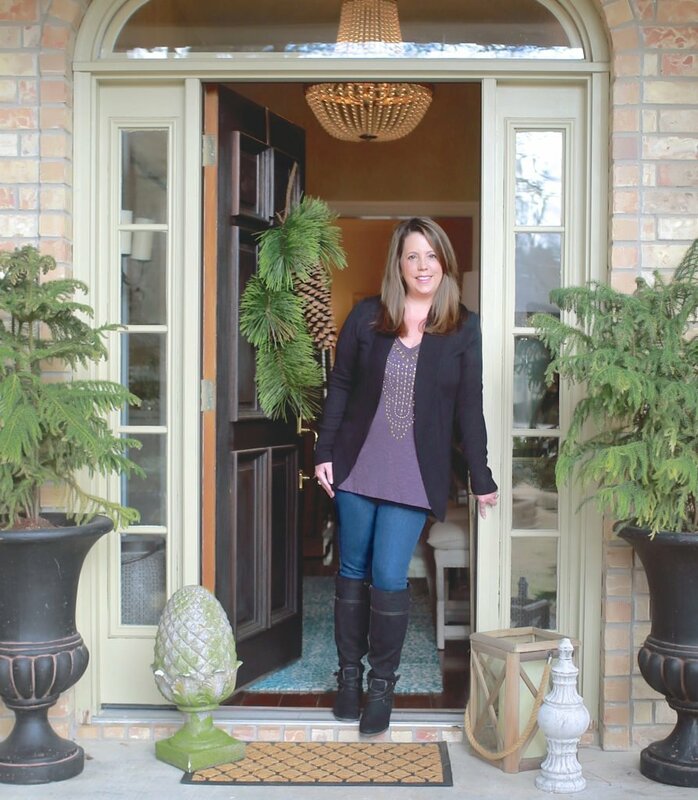 I’m focusing on creative kitchen organizing today with some of my favorite Kirkland’s products along with a few tips to help maximize cabinet space. At the end of the post, we’re also giving away a $100.00 Kirkland’s gift card to one lucky winner! I like to organize kitchen cabinets by task like a baking cabinet, or a dedicated coffee cabinet filled with the coffee cups, coffee, and all the other hot beverage related supplies. By doing this, everything is together in one place when I’m doing a task and it’s more efficient. I can also quickly spot when I’m out of something and it’s really helped to move some things out of my very small pantry. Today, I’m organizing a cooking cabinet that is right next to my stove. 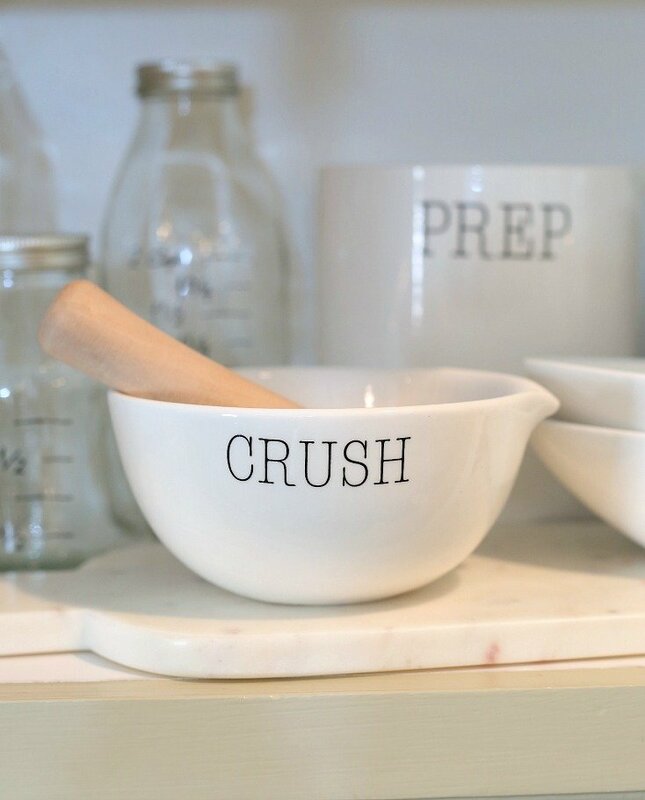 When I saw all the fun labeled ceramic bowls and cooking accessories at Kirkland’s I knew that was exactly what I needed to pull together my cooking cabinet. Everything we need now for cooking and prep is now right there next to our stove. Here are some close ups of some of the cooking pieces. 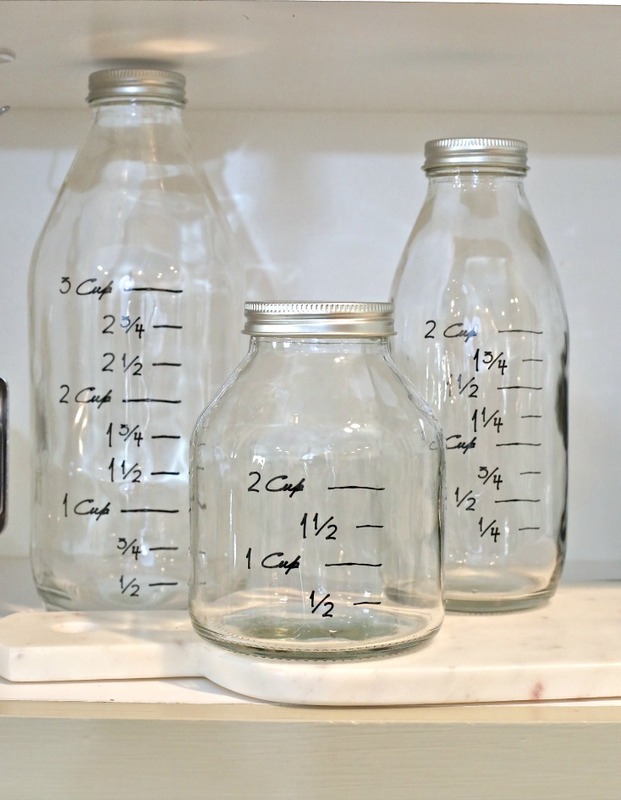 These Clear Odile Measuring Bottles are awesome and perfect for measuring liquids and they are just so fun! 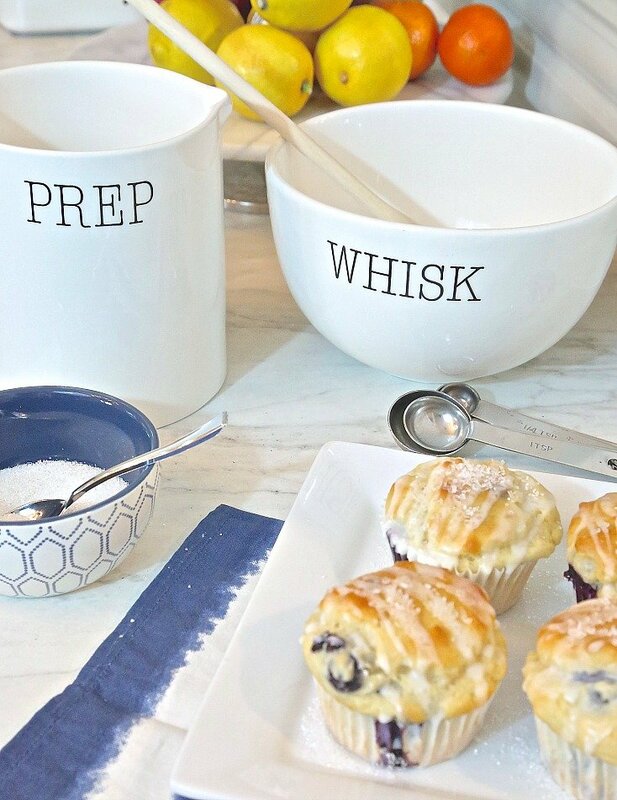 The Whisk, Mix and Stir Mix Bowls come in a set of 3 and they are all just the perfect sizes. 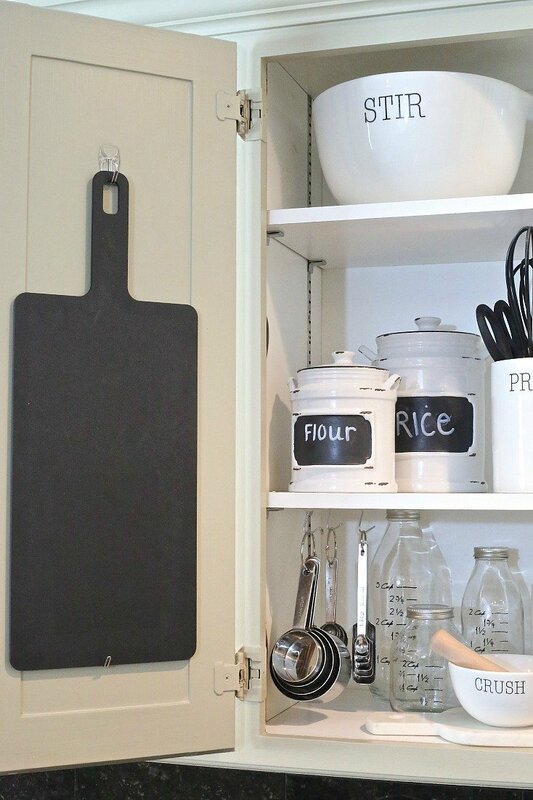 A quick trick for hanging a cutting board on a cabinet door is to use Command Strips with the metal hook. To keep the board from moving when you open/close the door is to add a second Command Strip at the bottom of the cutting board to secure it. You can also use the hooks on the bottom of shelving to securely hold the little cooking prep stuff like measuring cups and spoons. I also slipped in the Wood and Marble Cutting Board (similar here) into the cabinet on the bottom shelf. 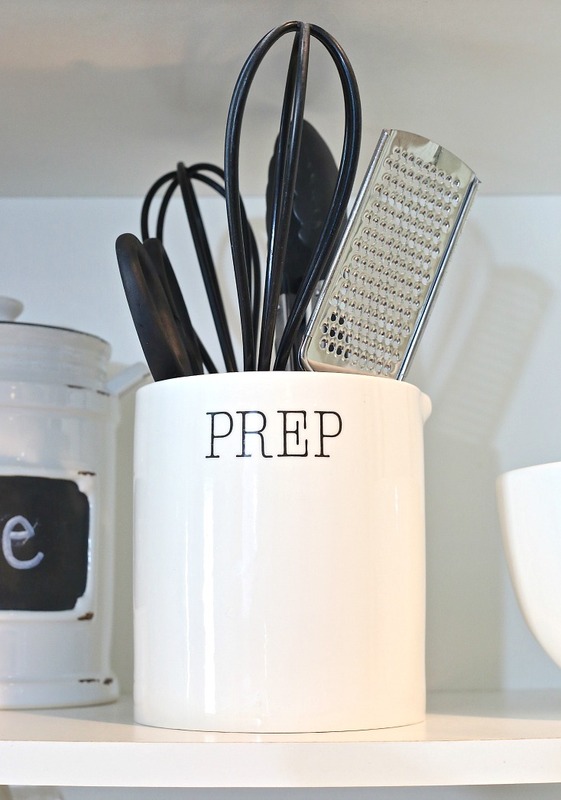 It’s perfect for both cooking prep and entertaining. We’re also giving away a $100.00 Kirkland’s gift card to one lucky winner! Yay! You can fill out your giveaway entry below ! This is a sponsored conversation written by me on behalf of Kirkland’s. The opinions and text are all mine. Crushing on this Harper Gray Scroll Area Rug! Kirklands is one of my favorite places to wonder around! They have such amazing price’s and the quality is awesome! 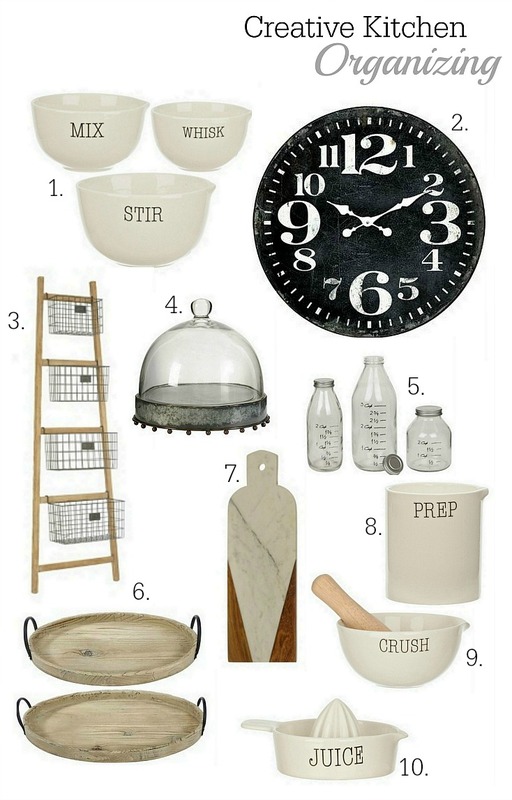 pretty trays, smart mixing bowls ( mine have a few chips) and easy to read measuring bottles are calling my name. 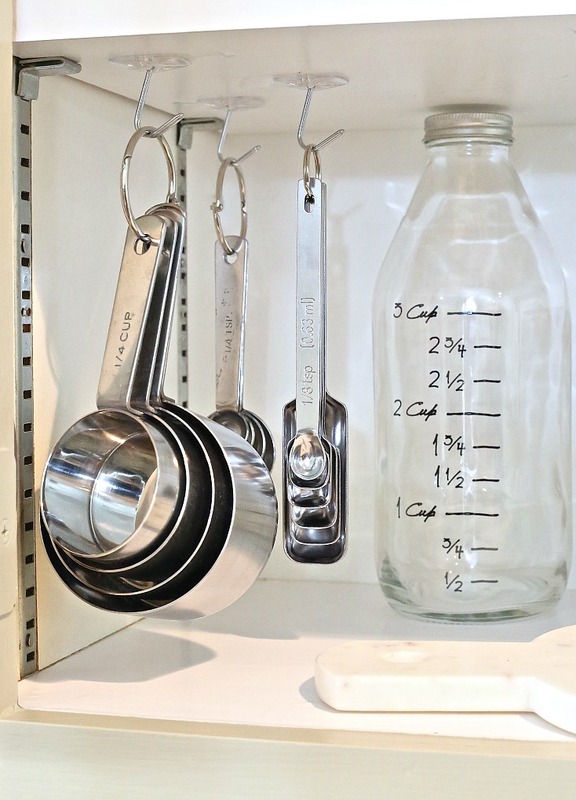 My cabinets will never look as good as yours, but I love the idea to hang measuring cups from hooks. Mine are just a jumble in the cabinet. Going to try this. Just moved to an area where they have a Kirklands store. 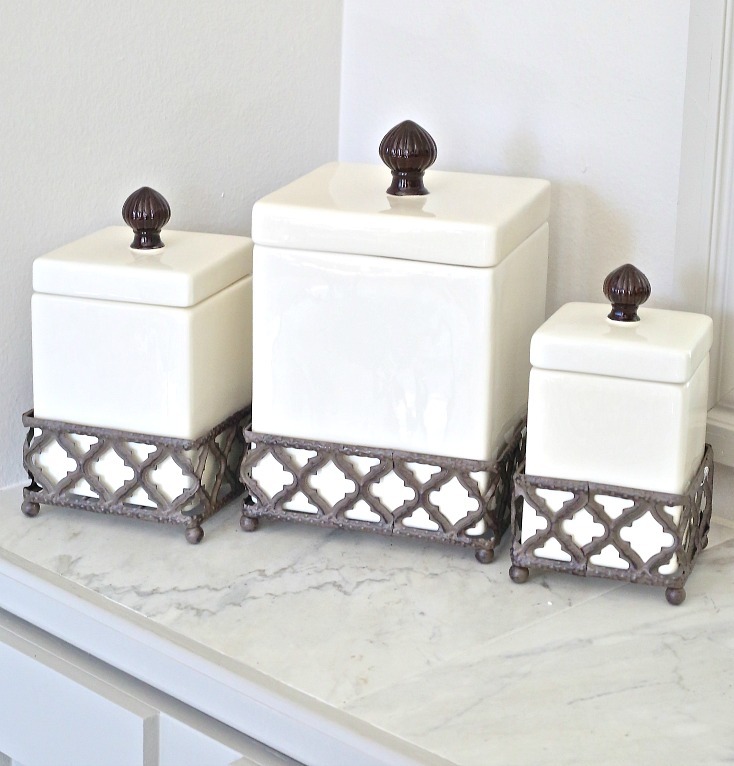 They have the cutest and best things to decorate your home. Prices and discounts are good, too! I love this the white is bright and clean. 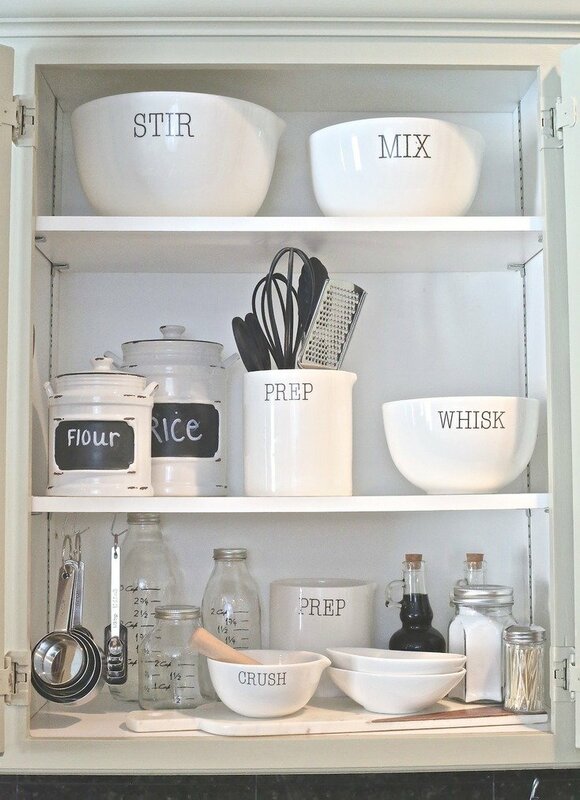 The organizational ideas are awesome would be proud to show this off in my kitchen. I love all these kitchen accessories, and mine could use some updating. Thanks for the idea of the Command strip hooks. I am going to definitely buy some and hang my measuring cups and spoons. So clean and simple, Love! 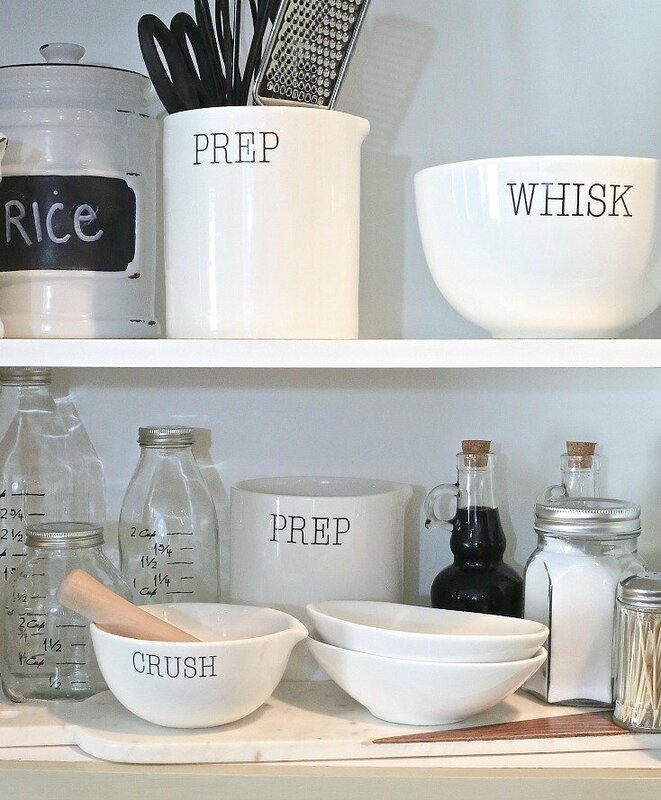 I especially adore the idea of the hanging measuring spoons. They are forever getting caught in drawers. I like to organize by baking, breakfast, sauces and condiments, etc also, but WOW! Either I need to purge or you live pretty bare bones. My cupboards are organized, but packed! 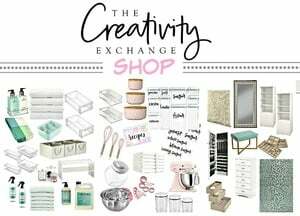 What do your food, spices, small appliances cupboards look l like?